hanare×Social kitchen：Event：Basic Income Game Release Party! 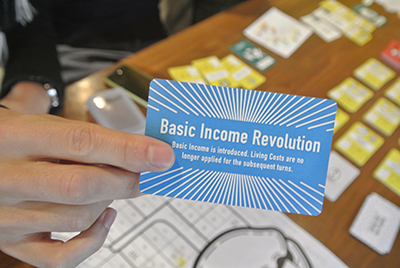 Top > Event > Basic Income Game Release Party! 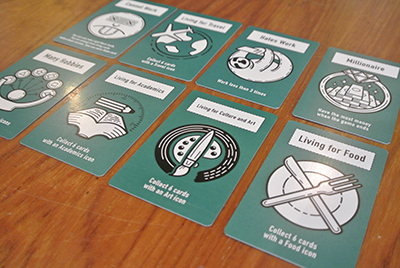 Inspired by the concept of Basic Income*, we Basic Income Kyoto (BIK) have finally completed the production of our new card game, COWRY (Ver.1). Over many discussions on what action to take with this forward-thinking and unique idea, BIK's first project has taken shape in the form of a card game. 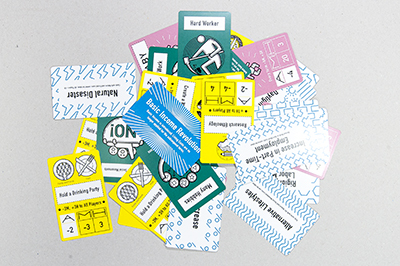 Using happiness as the driving force of the game, the game not only lets players experience life before/after Basic Income is implemented, but also enables players to rethink issues related to redistribution of wealth, paid labor/unpaid labor, unemployment, while raising a personal question of how YOU want to live your life. We warmly invite you to our party to introduce the activities of Basic Income Kyoto with the unveiling of our card game. Join in on the fun and participate in our round of games on this lovely occasion. *Basic Income is a proposed policy which gives citizens of a country the right to receive a regular sum of money unconditionally as a form of social security. At its foundation is a simple and warm idea, and its philosophy has gained worldwide support and relevance. -19:00 Talk: What is Basic Income Kyoto?